The Boston office, which opened in 2009, is a near one-stop shop for corporate legal needs. Most of the office’s lawyers previously practiced at premier Boston or national firms, and all of them have many years of experience representing clients in complex, challenging matters. The Boston team includes seasoned commercial and healthcare litigators with extensive trial experience, and lawyers with strong backgrounds in insurance coverage, bad faith, and extra-contractual matters. Others are knowledgeable in corporate and securities, finance, private equity, and venture capital. We also regularly handle environmental, intellectual property, patent, labor and employment, construction, professional liability, corporate governance, and toxic tort matters. 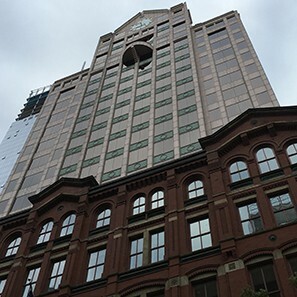 The office is located in the historic Downtown Crossing section of Boston. It is in close proximity to local, state and federal courts and our familiarity with the local bench and bar, as well as government entities with whom our clients have frequent contact, allows us to better serve our clients.